The cervical spine anatomy is a complicated region of the upper vertebral column. The neck is responsible for allowing a full range of movement to the head, which is a troublesome task, given the weight and importance of this hefty structure. You may have already read our resource section detailing the anatomy of the neck, but now, we will go into even greater detail regarding some of the lesser discussed structural and functional aspects of the cervical region. In fact, we will concentrate this discussion on analyzing the curvatures of the cervical region, as well as how the cervical anatomy can be implicated in causing a variety of neck pain scenarios. 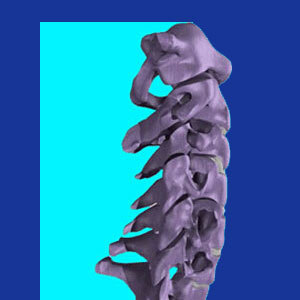 A typical cervical spine will show absolutely no side to side curvature, when viewed from the objective front or rear. Scoliosis of the neck is a rare event and is seldom seen to any large degree in the cervical spine. However, the cervical region does demonstrate a pronounced lordotic curvature, which means that the open side of the curve faces the posterior of the body. This curvature is a secondary developmental trait, not a congenital one. This means that unlike the thoracic curvature, which is inborn, the cervical region develops its unique curves at a specific stage of early childhood development. When the cervical lordosis is exaggerated, the patient is said to display a hyperlordotic curve in the neck. Meanwhile, when the curvature of the neck is underdeveloped, the patient is pronounced as having a hypolordotic cervical spine. While both of these conditions can factor into various neck pain scenarios, many patients will demonstrate atypical curvatures, but still not have any pain whatsoever. Many abnormal exaggerated or deficient curvatures are innocent of causing any pain, while only the most severe irregularities are usually deemed to be wholly causative in a symptomatic condition. Furthermore, some causes of straight neck, or overly curved neck syndromes, are actually the results of neck pain, rather than a contributing process. In these cases, it is usually the muscles which are pulling the cervical spine into its irregularly curved configuration. It is true that the spinal components in the neck are the least durable and hardy of any of the vertebral and intervertebral structures. They are thinner and lighter than their thoracic and lumbar counterparts. It is also true that the cervical spine endures considerable structural degeneration as part of its lifecycle. Constant movement of the neck, combined with the weight burden of the head, all add up to increased evidence of osteoarthritis and degenerative disc disease in the neck. It is not uncommon for the facet joints to show wear and tear by the age of 30 to 40 and osteophyte formation throughout the region is normal, at about the same age. Meanwhile, disc desiccation usually is present in the late 20s and continues to progress for life. This being said, these process are not inherently painful and often act as convenient, but incorrect, diagnostic scapegoats, to explain otherwise idiopathic neck symptoms in an alarming number of patients. 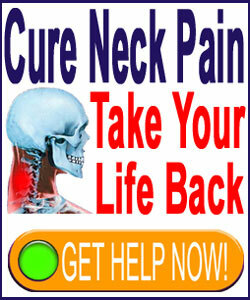 If you have been diagnosed with a structural “problem” in the neck, do not fear just yet. First, take time to research your diagnosis from a variety of quality, objective sources. Remember that very few mild to moderate anatomical irregularities will cause any significant degree of neck pain. This is a proven fact. This also explains why so many medical associations have cautioned doctors never to blame pain on coincidental anatomical degeneration. It is a sad fact that this advice goes largely unheeded, as many physicians and chiropractors still live in a less enlightened, but far more profitable, age of healing science. This basically means that treating these normal conditions was commonplace in the past and still brings in vast sums of money. Why change a good thing, just because science now sees little evidence of a pathological process? Treat, inject, and operate some more and make that money. That is the way of modern medicine. Don’t become a victim. Understand the strengths and weaknesses of the anatomy of the neck, but be sure to objectively view the degenerative processes for what they really are… universal parts of all human aging.